I have always enjoyed a good fantasy series, but have found only one series that can come close to comparing itself to J.R.R. Tolkien’s Lord of the Rings and that is George R.R. Martin’s Song of Fire and Ice. Apparently, you need to abbreviate your middle name and make sure that it begins with an “R” if you want to belong to this elite group of writers. Scott L. Collins hoped to make it to this group with the addition of his Scepter novel. He even abbreviated his middle name in order to invoke the spirit of Tolkien and Martin, but he made the mistake of using the letter “L” instead of “R”. Still I would give the first installment of this series three and a half stars out of five. Let me start by making one thing clear; writing a fantasy series is always a hard thing to do, and the first installment of one always seems to drag a little bit. The author has to spend those pages creating the exposition for the story, and there is a lot of it to create in order to have an engaging fantasy story. The writer has to create the world so the reader can see it. He has to establish the rules of this world, and explain its history up to the point where the hero is introduced to the story. If he does not do this then the story falls flat with two-dimensional characters that nobody will care about. Because of this, the first installment of any fantasy series tends to drag a little bit. If you don’t believe me, go read The Fellowship of the Ring again and notice that it takes Tolkien a good 150 pages before the story even gets started. Even after that moment, the story falls into ruts where nothing seems to happen except for Tolkien describing the world around you so you can understand its landscape and its history. Even though it is slow to read, it is also the thing that makes the story so engaging because the reader feels a part of Middle Earth. With all of this in mind, Scott L. Collins does take the time to create the history of his world. 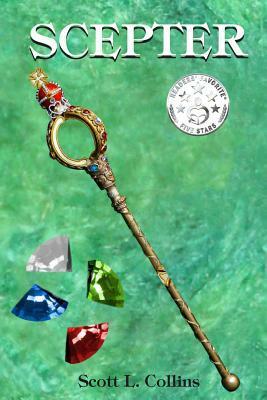 A scepter was gifted to a kingdom by the fairies to insure peace and tranquility among its people. At the head of the scepter there were four jewels that represented the four corners of the kingdom, but King Argyle removed the four stones from the artifact and threw the scepter into the river never to be seen again. War soon started and King Argyle collected people to work as slaves in his mines. Existence was terrible and even a terrible disease took over the land. If infected with it, a person could die, but if they survived they were gifted with powers. Most of these powers were pretty useless like being able to see really far away or super sensitive hearing, but every once in awhile, the person gained super powers. This happened to two brothers whose parents were taken away to work in the mines. Daniel was given the power of super speed, and Aidan received the ability to influence animals and even turn into ones that he shared water with. On Daniel’s fourteenth birthday, Argyle’s men showed up at Daniel and Aidan’s home to take away the older brother to work in the mines. This is when the real story starts as the brothers decide to fight back. The story in itself is inventive, and I really enjoyed the rules that Scott L. Collins created with his world. The action scenes were also really fun, even though the bad guys that the group fought were two-dimensional. It brought up images of the old G.I.Joe show where the faceless army of Cobra shot aimlessly at the heroes while G.I.Joe could take out these identical drones with ease. A great enemy that the reader can connect with is a plus with any adventure series, and I don’t feel the enemy here. They turn out to be faceless robots that I have no passion for and seem to be placed in the story to give the heroes something to fight. Argyle might turn into that villain eventually, but once again I was reading the exposition of the story and was never really given the opportunity to meet him. I also was never able to see the world that the heroes were traveling in. I think the world is just as important for any fantasy series. It has to become a character in of itself, and I could never see the landscape and how the world played out in a strategic fashion. I would have liked to have visualized this a little more. A lot of time was also spent with the characters doing nothing but nursing injuries. I can see the importance of doing this in real life, but I never found this to be very engaging unless the injury that they are nursing is something huge and moves the story forward. There are many moments in this story that seemed to be placed there for filler and didn’t seem to have much to do with the overall story. I could be wrong about that though because it is a bigger story and these small details that I think are unimportant now could come back later to be something bigger. For the most part, the story was entertaining and the history that Scott L. Collins has created makes me want to continue on with the series. The problems I had with the story were minor compared to the overall enjoyment of the story and I can see the story getting more exciting as it progresses. Now that I have made it through the exposition and the story can start to be told, I will continue to follow the adventures of Daniel and Aidan to see where they will eventually take me.